Relaxed Fit V-Neck Tees Only $6.99! You are here: Home / Great Deals / Relaxed Fit V-Neck Tees Only $6.99! Don’t miss out on this great layering piece for summer. 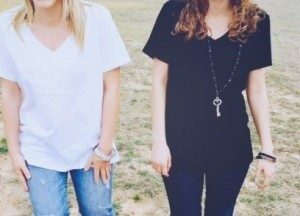 Comfy & Cute this Relaxed Fit V-Neck Tees Only $6.99! Great for wearing under a fun cardigan or blazer for a casual night out!